Like a crossbreeding of Asterix and Obelix, he seems to have just been walked out of the comic book with the same name. But where the savage comic characters fight their enemies on every occasion, Richard Christy with his soothing voice is kindness personified. He is known for his work with Iced Earth, Demons & Wizards and Burning Inside, but above all, Death and Control Denied. EmptyWords had a chat with one of the most gifted drummers of our time. When we met you the last time it was after an Iced Earth gig. We wondered if you're still able to keep all the bands and projects apart? Well I stay very busy, but I like it that way. I like to always have something going on and I really enjoy playing in all of the bands that I am in. The bands that I am in are all metal, but they are each very different sounding types of metal. Most of my time is taken up with Burning Inside. We practice three or four times a week here in Orlando where I live and we all spend a lot of time on our own writing music for the band. We just finished writing our new album. Also a lot of my time is spent practicing on my own. I try to practice for two hours a day. Can you tell us something about what you're currently doing? Right now I am recording the demos for the new Burning Inside album at my house. I also work during the day as an electrician and I try to exercise and lift weights for an hour a day, so between that and my bands I am always very busy. A growing amount of music lovers have come to recognize your drum abilities. Was being in Death the Zappa-effect for you? I mean, was Death the springboard which helped you launch your career? Oh, definitely. Death is the reason that people know my name and I am very thankful to Chuck for giving me the chance to play in one my favorite bands. I have been a Death fan for about twelve years now and I am a big fan of Sean Reinert and Gene Hoglan. I think they are two of the greatest drummers in music so it was a lot of pressure to play in Death, and it is a great honor to have followed in their footsteps. We know Chuck's story of your first encounter. (We can picture two of Orlando's finest browsing through the music mags, hahaha). What's your story? It was March of 1996 and I was with Steve Childers from Burning Inside at the Altamonte Mall in Altamonte Springs Florida where Chuck lived. Burning Inside had just moved to Florida from Missouri and I knew that Chuck lived in Altamonte Springs so I was hoping to see him somewhere. Well, Steve and I walked into a bookstore and Chuck was reading a magazine. Steve and I looked at each other and couldn't believe that it was Chuck. We introduced ourselves and talked for a long time. Afterwards we were both very excited because we are both huge Death fans. Chuck was known for having a nose for good musicians. Was your entrance in the band just a coincidence, or was it the logical next step in your musical developement? Well, a good friend of mine named Rick Renstrom, who was also a good friend of Chucks called and told me that Chuck was looking for a drummer and I knew that it was the opportunity of a lifetime so we arranged an audition. I was very nervous but everything went really well because I had played along to the Death albums when I practiced the drums by myself for many years. We know about the strong friendship between the two of you. Have you been able to come to terms with Chuck's loss? It is still hard for me to accept that Chuck is gone. Every time I hear a great new song or see a cool new movie I wish that Chuck was here to enjoy it too. We were very much into the same things, like music and movies, and our sense of humour was very much alike. It was so great to have a friend that made such great music and was also so much fun to hang out with. We had many great times together and I cherish the memories that I have of Chuck. For many Death was very special, we assume for you as well. Can you tell us what it is for you that makes Death so unique? Death was the first extremely heavy band that I ever heard that mixed heaviness with melody. Chuck's riffs were very original and had their own sound. Chuck's lyrics were like poetry, there was a lot of feeling in them, and I think a lot of fans could relate to his lyrics, especially the later albums. Is there still life after Death anyway, musically and technically? It was very challenging playing in Death, especially when I played Sean and Gene's parts live, and I know touring with Death made me a much better drummer. I will continue to try to improve my playing, because it is a neverending thing and I'm thankful that playing in Death helped me to improve my drumming techniques. With Iced Earth you played so sober and tight, that we got the feeling that you were restraining yourself, and for almost three hours at that. Do you feel that Jon Schäfer allows you enough freedom as a drummer? 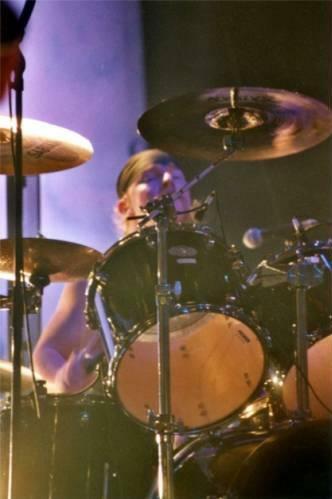 Yes, I really enjoy playing Iced Earth's style of drumming, I would never want to go into a band and drastically change what was done before me so I am trying to stick with what Mark and Brent had done on the recent Iced Earth stuff. I play with a metronome with Iced Earth which is actually just as hard as playing very technical music because I have to be exactly on time with the click. I've become used to the blisters, I actually expect it when I tour. Especially when we are doing three hour shows. I don't think human hands are made to take that much abuse. When did you get your first drumkit? I remember I had to nag a lot with my parents. Well, I got a snare drum when I was 10 and I played that for a year. At age 11 my parents bought me an old 1940's era Gretsh drumset for 100 dollars which is very cheap for a drumset. I am still very thankful that they supported my musical interests. They would even let me play my drums at night when they were sleeping, after a while they got accustomed to the noise. What equipment are you currently using, and how is your kit set up? I use Pearl Drums, Axis drum pedals, Vater Drumsticks, and Sabian cymbals. I have a nine piece double bass set with a rack system. I also have three electronic Simmons drum pads which I like to use for drum fills in Burning Inside. I also used them on the new Control Denied. Did you ever take lessons, or did you drop out like Chuck did after two Christmas carols? I started taking lessons in school at age ten and I still try to take lessons whenever I have the time. I mostly buy my own drum books now and teach myself for a couple hours a day. Bobby Jarzombek, Shannon Larkin, Rick Colaluca, Terry Bozzio, Sean Reinert, Gene Hoglan, Alex Van Halen, Chad Sexton, Alex Marquez, Ed Begley Jr.
We still haven't got your list of 5 favorite albums, here's your chance..
Back to reality. What about the last Control Denied album that is still laying on the shelves? Chuck told us, at the beginning of 2001, that your drum tracks were recorded. He was very proud of it and said that you really outdid yourself on this record. Will it ever see the light of day? Yes, hopefully some time next year. The drums are finished and Chucks guitars are finished. It is an honor to be complemented by Chuck, because I have been a fan of his for so long, and ten years ago I could have never imagined that I would play in one of my favorite bands and be getting compliments from Chuck. I would describe the new music as being very melodic with some parts that will have people shaking their heads thinking, what just happened? Because there are some very creative technical parts and many odd time signatures mixed in with Chucks signature guitar riffs. I am certain that the fans will love it. The music business is very unpredictable and complicated, there is definitely a dark side to it, hopefully the new album will overcome the problems and be available soon to all of Chucks fans that have been waiting patiently for it. Are you still in touch with the other guys? Yes, I talk to them on the phone when I can. I saw Scott Clendenin at a show about a month ago and I saw Steve when I was in California in July. To keep practicing and try to improve on the drums. To tour as much as possible. To help finish the new Control Denied album. To practice playing the guitar more, I have had a guitar for ten years now, but in the last few years I have been playing it a lot more and I love it! And to record and tour with Iced Earth and Demons and Wizards. Last but not least, tell us all about T-Back! T-BACK is a character in a low budget comedy movie that I made a few years back. I have made four comedy films and my newest one was premiered at a movie theater here in Orlando. It was a dream come true seeing my movie on the big screen and I hope to film another movie in the near future, so expect to see a lot more of T-BACK! Thanks! Take Care! 2001 - Death / Live in L.A.